Is it in your plan to buy brand new car this year? Or have you already purchased a car but do not know the best way to ensure absolute protection of the car to avoid dent, scratches, dust and other dirt? Plastic film is usually the first choice of people when they purchase brand new car. But after that what should you do next to protect your new car? Here offer you suggestion with different car body protection for you to choose. You are going to find out the best and suitable car protection products designed to guarantee absolute protection of your car when you read through this article--car cover, car tent, Lanmodo car umbrella. The waterproof car cover is among protection for car some people normally go for. This particular protection just as the name connotes, is built for waterproof and dust proof purposes. So, you will be certain of protecting your car from rain drop and water splashes when you cover it with waterproof car cover. But, there are some cons or downsides associated with waterproof car cover which you need to know before deciding whether or not it is best choice for you. It is not suitable for everyday use by car owners as it is designed to be used when car owners want to travel for a long journey. Another downside associated with this waterproof car cover is that most users have complained of not looking cool their car. If stationary car protection at home is what you are looking for, the whole protection car tent will serve you better. But, if you want a portable one with your car, the below one Lanmodo car umbrella will suit your needs better. Rainproof, waterproof and dust proof: With Lanmodo car umbrella protecting your car, you will not need to worry about rain drops, water splashes and even dust. That is why it is known as the best car protection in the market today. Snow-proof and overall protection: Snow-fall will no more be your problem with Lanmodo car umbrella with you. It is built with the material that can perfectly protect your car from effect of snow and other kind of dirt. 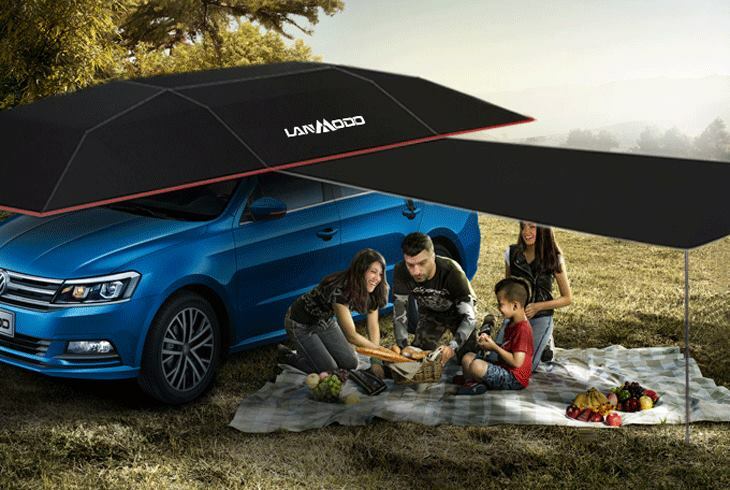 Anti-heated theory and sunshade: With the anti-heated theory of Lanmodo car umbrella, you will no need to worry about warming up your car while under the sun. The umbrella will absorb the heat and avoid hot sun ray touch car directly to give user sunshade and comfort in a well controlled temperature. Variety of colors for user's choice: Your car will look cool and amazingly beautiful when covered with Lanmodo car umbrella. More so, you will stand chance of selecting your preferred cloth color when you buy this car umbrella. Automatic folding feature: Another interesting thing about this car umbrella is that it is built with automatic folding feature. That means with a touch on the remote, the umbrella will unfold by itself to protect your car. Changeable: You will also stand chance of changing the umbrella cloth from this one to another one if you so desired. Indeed, Lanmodo car umbrella is suitable virtually everywhere at any time and on every vehicle, making it the recommended car protection you need.